2011-05-07. New. Ships with Tracking Number! INTERNATIONAL WORLDWIDE Shipping available. Buy with confidence, excellent customer service! 2006-05-03. New. Ships with Tracking Number! INTERNATIONAL WORLDWIDE Shipping available. Buy with confidence, excellent customer service! 2011-05-07. Good. Ships with Tracking Number! INTERNATIONAL WORLDWIDE Shipping available. May not contain Access Codes or Supplements. May be ex-library. Shipping & Handling by region. Buy with confidence, excellent customer service! Scribner, 2005. Hardcover. New. 9 x 6 cm. Scribner. First Edition. Hardcover. Fine w Fine DJ. 9.1 x 6 x 1.2 inches. Scribner. Hardcover. 0743247515 New Condition *** Right Off the Shelf | Ships within 2 Business Days ~~~ Customer Service Is Our Top Priority! - Thank you for LOOKING :-) . New. Scribner. Flat Signed By Author On Book Plate On Ffp. Clean Tight And Square. No Markings Or Creases. With Little Shelf Wear. . Very Good. Hardcover. 2005. New York: Scribner, 2005. Hardcover. Fine/Fine. Hardcover in dust jacket. Later printing. Book and unclipped dust jacket are in fine, As New condition, crisp and clean and unmarked. 8vo. 326 pp. In protective Mylar. SCRIBNER. New. 9 x 6.06 cm. Scribner. Paperback. 0743297326 Please allow 4 - 14 business days for Standard shipping, within the US. Thank you for supporting our small, family-owned business! . New. 2006-11-21. First PB Edition. Scribner. Paperback. 0743297326 Please allow 4 - 14 business days for Standard shipping, within the US. Thank you for supporting our small, family-owned business! . Fine. 2006-11-21. First PB Edition. Scribner. Hardcover. 0743247515 Please allow 4 - 14 business days for Standard shipping, within the US. Thank you for supporting our small, family-owned business! . New. 2005-09-27. Scribner. Hardcover. 0743247515 Please allow 4 - 14 business days for Standard shipping, within the US. Thank you for supporting our small, family-owned business! . Fine. 2005-09-27. Tantor Audio. MP3 CD. 1452653437 Special order direct from the distributor . New. Scribner. Hardcover. 0743247515 Special order direct from the distributor . New. New York: Scribner, 2006. Softcover. Very Good. Later printing. Trade paperback. 330pp., [12pp.] Excerpt of author's next book *In Search of Bacchus*. Spine crease, edges rubbed, very good. Scribner. Hardcover. 0743247515 Please allow 4 - 14 business days for Standard shipping, within the US. Thank you for supporting our small, family-owned business! . Fair. 2005-09-27. Scribner. Paperback. 0743297326 Please allow 4 - 14 business days for Standard shipping, within the US. Thank you for supporting our small, family-owned business! . Fair. 2006-11-21. First PB Edition. Scribner. Hardcover. 0743247515 . New. Scribner. Hardcover. 0743247515 Minor shelf wear . Very Good. Scribner. Hardcover. 0743247515 signs of little wear on the cover. . Very Good. Scribner. Hardcover. 0743247515 Note written inside title page. . Fine. Scribner, September 2005. Hardcover . 8.5 Bulk HB Premium. Scribner. PAPERBACK. 0743297326 Special order direct from the distributor . New. Scribner. Hardcover. 0743247515 *BRAND NEW* Ships Same Day or Next! . New. Scribner. Hardcover. 0743247515 *LIKE NEW* Ships Same Day or Next! . Fine. Scribner. PAPERBACK. 0743297326 . New. Scribner. PAPERBACK. 0743297326 Remainder mark . Fine. Paperback. New. Told for the first time by the only reporter present, this is the full story of the mythic Paris Tasting of 1976--a blind tasting where a panel of esteemed French judges shocked the industry by choosing unknown California wines over France's best. NEW YORK: SCRIBNER. VG IN WRAPS. REMAINDER MARK. FAINT EDGEWEAR. Pages: 331+. . 2006. LATER PRINTING. TRADE PAPERBACK.. PAGES CLEAN & TIGHT. . Condition: VG IN WRAPS. REMAINDER MARK. FAINT EDGEWEAR. Pages: 331+. New York: Scribner, 2005. Cloth/dust jacket Octavo. Hardcover. Very good/very good. yellow paper to red cloth with gilt lettering illustrated dust jacket 327pp. New York: Scribner. Fine copy in fine dust jacket. 2005. Later prt.. hardcover. 8vo, 327 pp. .
Scribner. Hardcover. 0743247515 Ships from Tennessee, usually the same or next day. . New. 2005. New York: Scribner. Very Good/Very Good. 2005. Hard Back. 8vo 0743247515 Dust jacket complete, unclipped. Original cloth boards slightly soiledto top edge. Bright gilt titling on spine. No ownership marks. 288 pages clean and tight. The only reporter present at the mythic Paris Tasting of 1976--a blind tasting where a panel of esteemed French judges chose upstart California wines over France's best--for the first time introduces the eccentric American winemakers and records the tremendous aftershocks of this historic event that changed forever the world of wine. The Paris Tasting of 1976 will forever be remembered as the landmark event that transformed the wine industry. At this legendary contest--a blind tasting--a panel of top French wine experts shocked the industry by choosing unknown California wines over France's best. 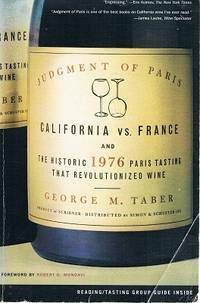 George M. Taber, the only reporter present, recounts this seminal contest and its far-reaching effects, focusing on three gifted unknowns behind the winning wines: a college lecturer, a real estate lawyer, and a Yugoslavian immigrant. With unique access to the main players and a contagious passion for his subject, Taber renders this historic event and its tremendous aftershocks--repositioning the industry and sparking a golden age for viticulture across the globe. With an eclectic cast of characters and magnificent settings, Judgment of Paris is an illuminating tale and a story of the entrepreneurial spirit of the new world conquering the old. .
Scribner. PAPERBACK. 0743297326 BRAND NEW, GIFT QUALITY! NOT OVERSTOCKS OR MARKED UP REMAINDERS! DIRECT FROM THE PUBLISHER!|0.82 . New. Scribner. PAPERBACK. 0743297326 *BRAND NEW* Ships Same Day or Next! . New. Scribner. PAPERBACK. 0743297326 *LIKE NEW* Ships Same Day or Next! . Fine. New York: Scribner, 2006. Paperback. 8vo. Ink mark to bottom edge, otherwise; very good. Scribner. Hardcover. 0743247515 This is a hardcover book with dust jacket. . New. U.S.A.: Scribner, 2005. Book. Near Fine. Hardcover. Near fine jacket..
New York: Scribner, 2006. 330 pages. Book is in general good condition. There is some light reading wear present, but still a presentable copy. The Historic 1976 Paris Tasting That Revolutionized Wine.. Reprint. Paperback. Good/None Issued.